My son decided he wanted me to make him a cardigan. 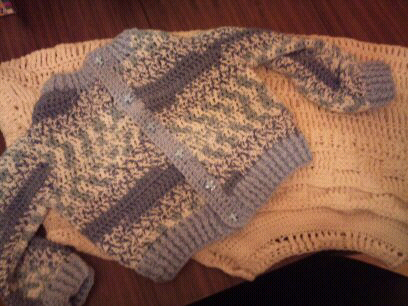 I found this pattern on http://www.redheart.com/ it's called "Funtime Child Cardigan". http://www.redheart.com/free-patterns/fun-time-cardigan. I made some slight alterations to the pattern as I was making it but it turned out really well. It's the very first pattern that I had followed. I did buy "crochet for dummies" first as this pattern was an american pattern and I wanted to make sure I used the correct stiches.